Family members examine the stones before they are laid into the walk. 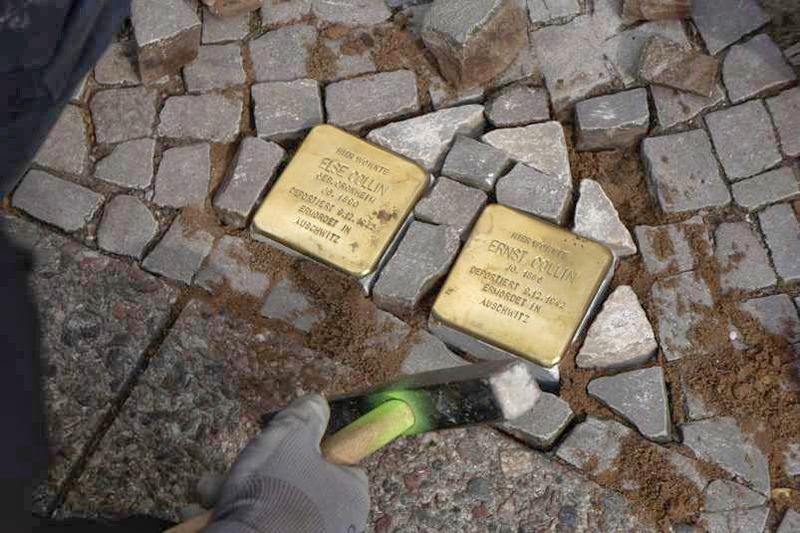 On April 1, 2014 two Stolpersteine (Stumbling Blocks) were laid to memorialize Ernst Collin and his wife Else (nee Cronheim) in front of the entrance to their home at Cicerostr 61 in Berlin. Stolpersteine are “monuments" created by Gunter Demnig that commemorate victims of the Holocaust. 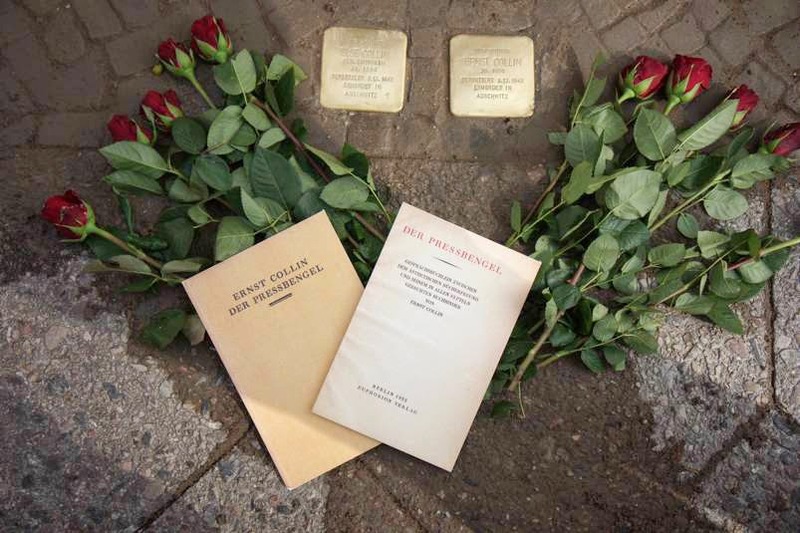 They are small, cobblestone-sized memorials for an individual victim of Nazism – both those who died and survivors – who were consigned by the Nazis to prisons, euthanasia facilities, sterilization clinics, concentration camps, and extermination camps, as well as those who responded to persecution by emigrating or committing suicide.” The “stones” record the name of the individual, their birthday, and their fate. 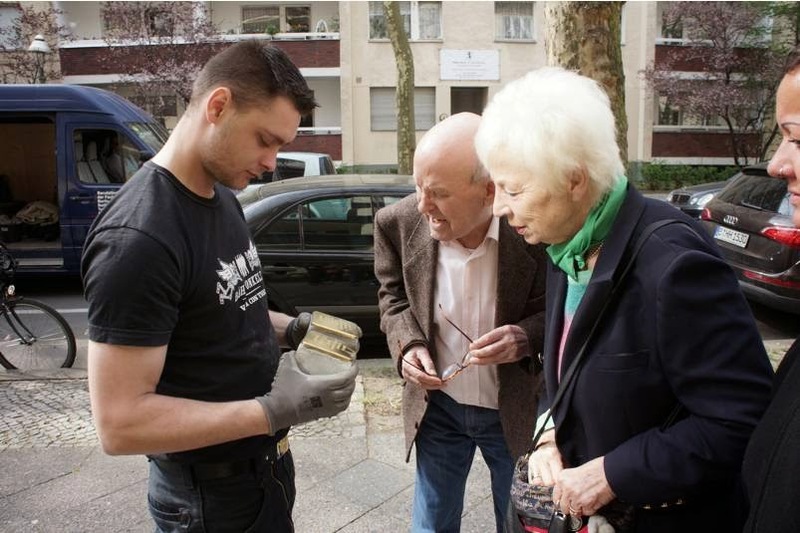 In Berlin the Koordinierungsstelle Stolpersteine works together with Stolperstein Initiatives in the various city districts, in this case Charlottenburg-Wilmersdorf. Ernst Collin, born on 31.5.1886 was the son and grandson of court bookbinders to the Prussian Kings and German Emperors. His grandfather W(ihelm) Collin (12.7.1820 – 1893) was the son of a [Beuthener/Bytom] physician Isaac Collin and Blümche (geb. Kircheim) who moved to Berlin in 1832 [Kaiserstr 13, Berliner Addressbuch]. Wilhelm apprenticed with the Prussian Court Bookbinder Mossner in Berlin 1835-40, and is shown as starting his own bindery in Berlin in 1845. He was later awarded the Preussischer Kronenorden. Ernst’s father Max Georg Collin (10.22.1851 - 12.24.1918) followed in his father’s footstep learning the trade with the Meister Hunzinger, followed by journeyman years in Vienna, Paris, London (with Zaehnsdorf), among others. He returned to Berlin to work in the family firm. During the winters between 1873 and 1875 he instructed Prince Heinrich (brother of later Kaiser Wilhelm II) in bookbinding. An anecdote from this experience is his response to complaints from the court about smelly glue – his response, well we can’t put Eau de Cologne in it, and that was that. [Bedeutende Männer des Buchbinderhandwerks, Der Buchbinderlehrling, 6. Jg., Nr 9, 1932] From 1878-1881 he studied painting at the Berliner Kunstakademie. In 1886 he became co-owner of the firm W. Collin, continuing it after the death of his father in 1893. Georg Collin was one of the leading binders in Germany, helping to revitalize the artistic expression of the craft with his prize-winning bindings and “Addressen,” presentation portfolios for decrees and other official pronouncements. Among the binders who credit Georg as their Meister are Paul Kersten and Maria Lühr. Lühr apprenticed with W. Collin, and it was Georg’s connection to the German court that ultimately led to the breakdown of prohibitions against women learning the trade and practicing as Meister, something for which Ernst was also a strong advocate. Like his father Wilhelm, Georg was awarded the Kronenorden and was the last to carry the title of Königlicher und Kaiserlicher Hofbuchbinder. He had three children with his wife Regina: Gertrude, who learned the family trade and carried on the family business, Elsa, and a son Ernst 31.5.1886. After Georg’s Death on 24.12.1918, his widow Regina continued to manage the firm of W. Collin until Gertrude took over. After 1930 the firm was continued as 1930 Spezialbetrieb fur Druckarbeiten unter Paetsch & Collin. The firm moved about in Berlin over the years, finally settling along the Kurfürstenstr. It was “liquidated” in 1939. Following in the family tradition, Ernst learned the trade of bookbinder. 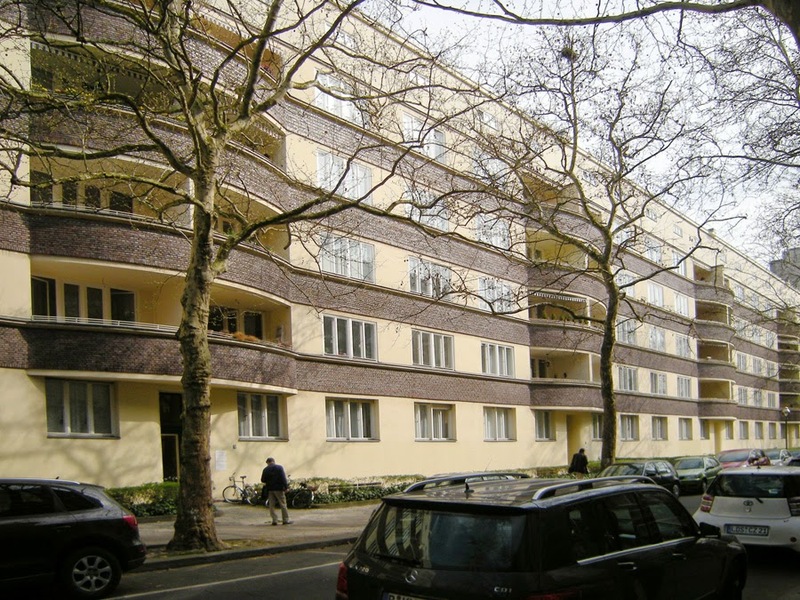 Where he apprenticed is not known, but he describes studying with Gustav Slaby and Paul Kersten at the Berliner Buchbinderfachschule Klasse für Kunstbuchbinderei for a semester in 1904 – he was a student in the first class. Ernst, however, chose to follow a different path, that of writer in particular for the arts of the book and graphic arts. His first as yet discovered articles appeared in Volume 3 (1907-08) of Die Werkkunst: Zeitschrift des Vereins für deutsches Kunstgewerbe and identify him as "Ernst Collin, Kunstbuchbinder" (Fine Bookbinder). He was also a journalist and art critic, writing on topics relating to economics and politics, as well as an antiquarian bookseller of fine press books via his Corvinus - Antiquariat Ernst Collin, located at Mommsenstr 27 in Charlottenburg.In addition, he was on the editorial board of the Berliner Volkszeitung. The list of his publications continues to grow having begun with 44 titles between Mejer’s Bibliographie der Buchbindereiliteratur (1925) and the 1937 volume of the Meister der Einbandkunst’s Jahrbuch der Einbandkunst, to over 200 with significant gaps in the chronology that hint at a far greater professional output. His first book was Buchbinderei für den Hausbedarf () a manual of basic bookbinding aimed at laypeople. His iconic Pressbengel was published in 1922 and was followed by his biographical Festschrift Paul Kersten (1925) in honor of his 60th birthday. Kersten was one of the most seminal German fine bookbinders, and his Der Exakte Bucheinband (1923) helped define German fine binding Ernst also wrote essays for Festschrifts published by the highly regarded trade binderies. These were Vom guten Geschmack und von der Kunstbuchbinderei for the Spamersche Buchbinderei, Leipzig (1918) and Fünfzig Jahre deutscher Verlegereinband for Hübel & Denck (1925). He was also the publisher of and author of numerous articles in Die Heftlade (1922-24), the journal of the Jakob-Krausse-Bund, an organization that was absorbed into Meister der Einbandkunst, a group that included the most significant names in German bookbinding of the late 19th and early 20th century, among them Paul Adam, Otto Dorfner, Paul Kersten, and Franz Weiße. Collin also edited and wrote in the Jakob-Krausse-Bund’s 1921 exhibition catalog, Deutsche Einbandkunst. Degeners Wer Ist's (10th Ed., Berlin, 1935) also gives pseudonymes Collenoni and Nicoll for him, but no writings under these names have been discovered as yet. His articles were published in at least 36 periodicals and serials between 1907 and 1936, among them Allgemeiner Anzeiger für Buchbindereien; Archiv für Buchbinderei; Archiv für Buchgewerbe; Börsenblatt für den deutschen Buchhandel; Buch und Bild: Berliner Herbstschau im Staatlichen Kunstgewerbe-Museum 1921; Das Echo: das Blatt der deutschen im Auslande; Das Plakat: Zeitschrift des Vereins der Plakatfreunde e.V. ; Der Buchbinderlehrling; Der Kinematograph; Der Kunstwanderer; Der Papier-Markt; Der Qualitätsmarkt; Der Sammler; Der Sturm; Deutsche Frauenkleidung und Frauenkultur; Deutsche Kunst und Dekoration; Deutsche Verleger Zeitung; Deutsch-nordisches Jahrbuch für Kulturaustausch und Volkskunde; Die Heftlade: Zeitschrift für die Förderer des Jakob-Krausse-Bundes; Die Kunst: Monatshefte für freie und angewandte Kunst; Die Werkkunst: Zeitschrift des Vereins für deutsches Kunstgewerbe in Berlin; Gutenberg Festschrift; Gutenberg Jahrbuch; Moderne Buchbinderei; Sammlerkabinet; Scherls Magazin; Tägliche Rundschau; Textile Kunst und Industrie; Verhandlungen, Vereins zur Beförderung des Gewerbefleisses; Volksverbandes der Bücherfreunde; Westermanns Monatshefte; Zeitschrift des Deutschen Vereins für Buchwesen und Schrifttum; Zeitschrift für Bücherfreunde; Zeitschrift für Bücherfreunde. N. F.; Zeitschrift für Neue und Alte Kunst, Graphik, Kunstgewerbe; Zur guten Stunde. Der Pressbengel (1922) dedicated to his father Georg is Collin’s best-known work. It was later republished by the Mandragora Verlag (1984) with an introduction by Gustav Moessner, and later translated into Italian as Dal Rilegatore d’Arte (1996). A translation into English as The Bone Folder by Peter D. Verheyen first appeared in the Guild of Book Workers Journal (2009). Der Pressbengel is a dialogue between a bibliophile and a master bookbinder on all aspects of the bookbinding craft as well as specific techniques. Throughout the work, Collin himself is very frank in addressing the conflicts between quality and cost, as well as the positive and negative impacts of “machines” throughout the work. Ernst Collin was also politically active, being listed as a contributor to Die Deutsche Nation: Eine Zeitschrift für Politik, along with the great bibliophile Graf Harry Keßler. The publication that was aligned with the Deutsche Demokratische Partei (DDP), a center-left social liberal party whose members included among others, Foreign Minister Walther Rathenau, party leader Friedrich Naumann, and Theodor Heuss who would become the first President of the German Federal Republic in 1949. 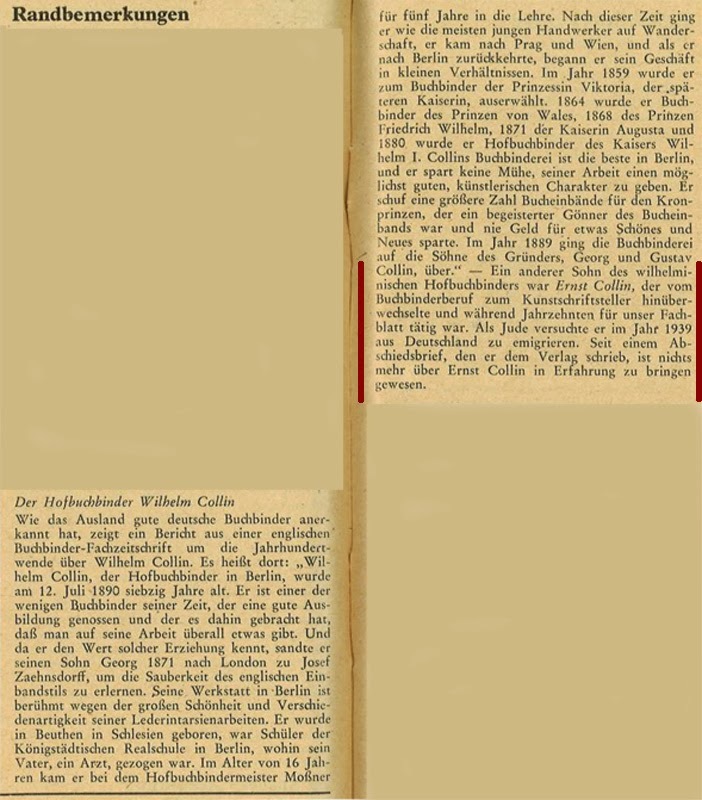 The 1947 issue of the Allgemeiner Anzeiger für Buchbindereien, the first published after the war included a notice (Randbemerkung) about the Collins (W. Collin, Georg Collin, and Ernst) in which it gave a brief history of these individuals and their work, also mentioning that Ernst had written for this publication for decades, and that as a Jew he had tried to emigrate in 1939, leaving a letter with the publishers. Nothing was heard from him thereafter. 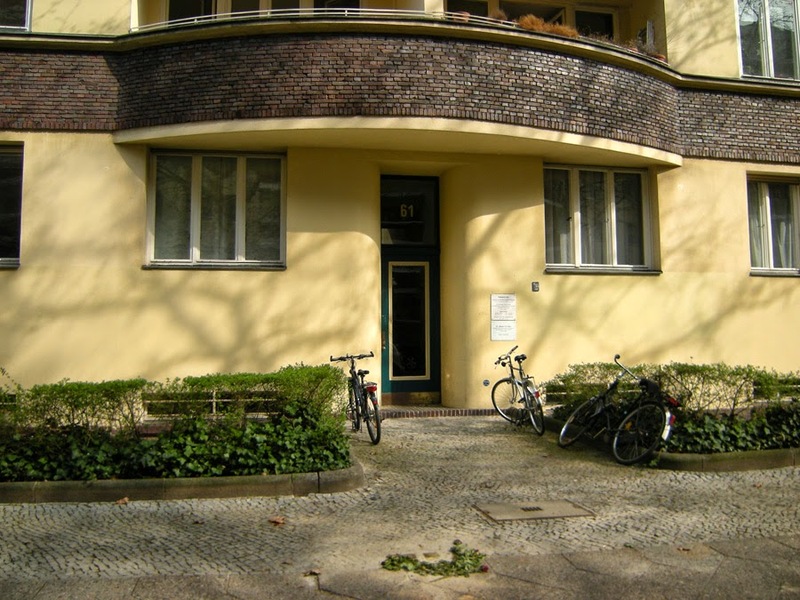 During his life, Ernst lived at Sachsenwaldstr 25 in Stegliz, moving to Cicerostr 61 in Wilmersdorf in 1929. Unfortunately, nothing is yet known about his wife Else Collin (nee Cronheim, born 18 March, 1890). The couple had no children. The Gedenkbuch Berlins der jüdischen Opfer des Nazionalsozialismus (Freie Universitaet Berlin, Zentralinstitut fuer sozialwissenschaftliche Forschung, Edition Hentrich, Berlin 1995) shows Ernst and Else Collin as being deported to Auschwitz on 12.9.1942 where they were murdered. Stolpersteine for Ernst und Else Collin, Wiki photos by "OTFW"
The Stolpersteine were sponsored by his surviving great-niece, Dr. Rita Jenny Kuhn; Dr. Kuhn’s daughter, Ruth C. Wiseman; and by Peter D. Verheyen. Dr. Kuhn is the author of Broken Glass, Broken Lives (Barany Publishing Co., 2012), a memoir of her survival in Berlin during the Second World War. Verheyen translated Der Pressbengel into English. Working together with Ruth to honor Ernst and Else this way has given my interest in Ernst and his writings as well as the Collins a much deeper meaning that has touched me, and for which I am thankful. The pictures below were taken April 3rd. The flowers are still there. 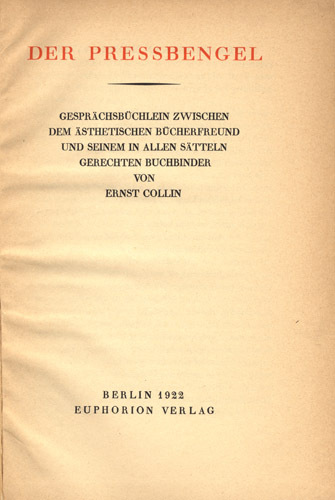 See also The Story of Two Ernsts, clarifying the details of Ernst Collins' life and death; disambiguation of the Ernst Collin discussed here and Ernst Heinrich Collin-Schoenfeld.